Yesterday ( Monday 8/22) was an eye opener when I looked at the gold/silver market. Gold was up to $1877 an oz, platinum up to $1892 and silver at $43.49 per oz. You know how people who invest check the stock market daily? I check the precious metals market daily and if silver has dropped down quite a bit, I'll order some. If silver is really high, I will hold off buying. In my 27 years as a metalsmith, most of those years, the silver and gold market was pretty stable. In fact, in the early 2000's, gold was so cheap, as low as $262 an oz, I worked constantly in gold, and silver was around $5 an oz, so it was a bargain. When I started out in the 80's, silver was pretty much in the $8 range for a long time, and then slowly dipped down to $6 in the 90's, and stayed at $5-6 an oz for a very long time. After 2006, and then when the recession came, gold/silver started climbing. I have been watching with horrified fascination as the silver starting skyrocketing late last year and this year in particular. I saw silver hit $49 an oz back in the spring, and was wondering if it would be $50 an oz, unseen since 1980 when the Hunt brothers tried to corner the silver market. For the last 3 years, as the price of silver became unaffordable, I started melting down the clean silver scrap I had, and since then, I've gotten very good at recycling my silver scrap. Any silver that does not have silver solder on it gets melted down in a crucible, poured into a casted iron ingot mold, and I get 1/4" to 1/8" short silver rods, that I roll through a rolling mill to make it longer and thinner. Once I have rolled my silver rods down to 12g-14g. square wire, then I pull them thru a drawplate to get them down to 16g, 18g. or 20g. round wire. It's a lot of physical work and as a result, I've got the shoulders of a linebacker now. It does help to stretch out my silver budget so that I can have silver wire on hand, and not worry about having to order often. I used to put in several orders a month to various jewelry suppliers, but it's now down to once, maybe twice a month, usually for special orders I have to do for clients. Today, one of my suppliers posted this banner saying they are experiencing technical difficulties with pricing. The wildly fluctuating precious metal market is causing trouble giving accurate pricing. That brings us to another point - how do I price my work? Sufficient to say, here's my formula - take price of raw materials, double the cost, add labor fees, 25% indirect costs ( ulities), add them together to get wholesale cost, and then double that to get retail price. For example - $75 raw materials, x 2 = $150, add 1.5 hours of labor ( at $60 a hour ) $90, add $15 for ulities, and it comes to $255. Double that, and it becomes $510. Now, psychologically, $510 may be too much, but $495 is easier to deal with, so most pricing you find tends to end in 99 or 95. Sometimes I will make something and a price comes to mind. Other times, I wrestle with the price, trying to find a good fit. Older work tends to be less and newer work tends to be more. These days, when I have to give an estimate, esp. on gold rings, very often the estimate comes out over $1500. There is nothing I can do to make the price more affordable, unless I am paying for it out of my pocket, which I shouldn't have to do. It really hurt to crunch numbers to give an estimate, let me tell you that. The precious metals market is really tough on us jewelers and metalsmiths, so be understanding when I have to charge more! 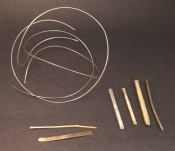 Here's a pic of my wire, ingot rods, bezel strip and some of the rods rolled down to square wire. This is as raw as you will see it. One last note, if you want some new gold jewelry, I'm happy to melt down your old gold jewelry, and make new jewelry out of it. All I will charge is the labor, and any new things added to jewelry ( gemstones, clasps, etc).